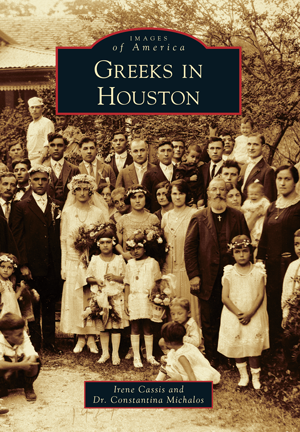 This history of the Greeks in Houston is really the story of individuals who worked diligently to forge new lives for themselves even as they maintained their Greek identity and their Orthodox faith. The efforts of many of the founders are immortalized in the buildings that constitute the Annunciation Greek Orthodox Cathedral complex. Their names remind us of their hard work and commitment to establishing their koinonia (communion) in Houston. There are many other names that have gone unremarked over the decades but to whom we owe just as much for their tenacity and dedication. And there are the new generations who inherited this legacy and keep it vibrant through the stewardship of their faith and culture. Irene Cassis is the director of religious education of Annunciation Greek Orthodox Cathedral and the coordinator of religious education for the Metropolis of Denver. Dr. Constantina Michalos earned her doctorate in literature at Rice University and is visiting assistant professor of English and director of tutorial services at the University of St. Thomas in Houston. The authors selected images from current and former residents, the Annunciation Greek Orthodox Cathedral archives, and the Houston Metropolitan Research Center of the Houston Public Library.